NBA superstar LeBron James has me standing up and applauding loudly. 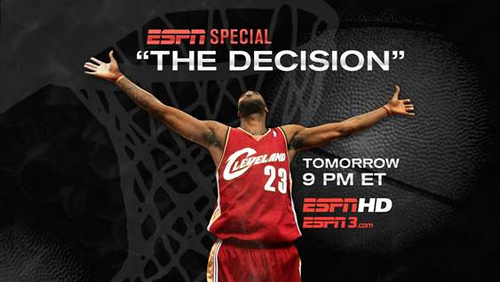 As you know, Thursday (tomorrow) night at 9 PM ET on ESPN and TSN in Canada, LeBron will hold the sporting world captive. That’s when he’ll announce which NBA team he’ll be playing with over the next several years. James has received massive amounts of criticism for deciding to make this declaration on national television. I think it’s the absolute perfect way for someone of his stature to put an end to the planet’s speculation. The media world is abuzz about the size of James’ ego. Everyone is moaning and wailing about the fact that James and his entourage have the audacity to announce his signing this way. Of course he has a huge ego! He’s LeBron James! Your ego would be the size of Cleveland too. Especially if mega-rich NBA owners were preening about and fawning over you and your game. And, you know what, they should be fawning and preening over him. James has met with six teams – the Cavs, the Heat, the Bulls, the Clippers (can’t figure that one out at all), the Knicks and the Nets. Basketball, even though it’s a team game, is the only major sport in which one player can make the difference every single game. I can’t think of the last NBA team to win a championship without a superstar on its roster. In today’s game, it just cannot be done. The demand for Ilya Kovalchuk in the NHL makes no sense at all. The demand for LeBron makes perfect sense. And, if I was in his shoes, I’d take advantage of it too. Way to go, LeBron. You’re taking the opportunity to make money here…for someone else…who could really use it. If every overpaid my-bank-account-is-so-big-my-children’s-children-will-never-be-able-to-spend-it athlete did what you are doing, the world would be a much more beautiful place. Now, all of James’ bravado would have much more impact and credibility if he’d actually won something. 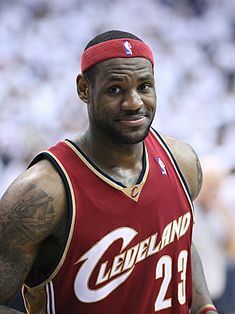 In his seven years in Cleveland, James has led the perennially pathetic Cavs to five consecutive playoff appearances – and one trip to the NBA Finals. That came in 2007 when they were swept by Tim Duncan, Tony Parker, Manu Ginóbili and the San Antonio Spurs. Tough opponent, for sure. James knows this is a huge step for him. The biggest since he left high school in Akron, Ohio to enter the 2003 NBA Draft. And it may very well be the biggest step of his career. Why shouldn’t we be able to watch it unfold? It’s sports marketing at its absolute finest. Now, all we’ve got to do is hope James makes the right decision – and stays right where he is in Cleveland. What makes LeBron big is his ability to maintain perspective. He knows he’s a huge star, and he’s using the system to his advantage – to pump up his bigger-than-life stature (“You’re welcome” whatever-team-gets- him-next) and to give back to the community he came from. He gets his world and I applaud him for using it in new and creative ways. I’m guessing the biggest whiners are the slime balls who make a living sucking off big stars from the sidelines – but only because they didn’t think of it first. Go big, LeBron. Then go home with a clear conscience. You know what I totally agreed with you until I saw LeBron on TV. What an uneloquent boring guy. Zzzzzzzzzzzzz. The media needs to STOP giving him attention! He’s putting this blonde to sleeepp! I think the whole affair was a disgrace. Many more important things in our two countries that rank much much higher than this. Find it very hard to believe that there where so many idiots that watch this for a hour.